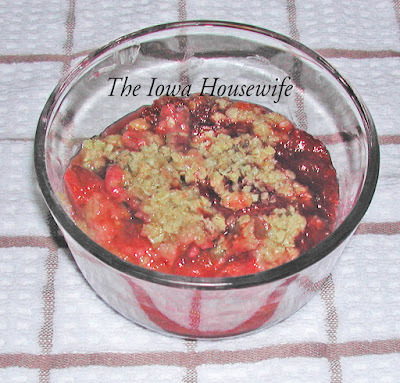 My rhubarb patch is so nice this year, lots of rain and now warm weather and so I am trying out rhubarb recipes. This recipe from the Barefoot Contessa cookbook How Easy is That was a winner at our house. The strawberries and orange juice in the recipe won over my daughter and Sue who do not like rhubarb and the rest just thought it was good. Not a lot of prep work and while I had to bake it longer than the recipe called for my oven tends to bake a little slow. If you want something new to do with your rhubarb and you like the combo of rhubarb and strawberries this is worth trying. I did make it Gluten Free using King Arthur Measure for Measure GF flour and GF Oatmeal. The fruit has cornstarch in it so check the label if you need GF. 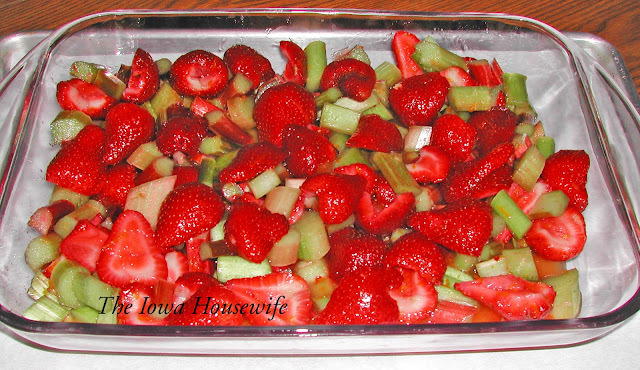 For the fruit, toss the rhubarb, strawberries, ¾ cup granulated sugar, and the orange zest together in a large bowl. In a measuring cup, dissolve the cornstarch in the orange juice and then mix it into the fruit. Pour the mixture into an 8 × 11-inch baking dish and place it on a sheet pan lined with parchment paper. For the topping, in the bowl of an electric mixer fitted with the paddle attachment, combine the flour, the remaining ½ cup granulated sugar, the brown sugar, salt, and oatmeal. With the mixer on low speed, add the butter and mix until the dry ingredients are moist and the mixture is in crumbles. Sprinkle the topping over the fruit covering it completely, and bake for 1 hour, until the fruit is bubbling and the topping is golden brown. Serve warm with ice cream. Rhubarb is not a common ingredient here in Mississippi. But, a crisp is nice no matter what you put in it. Rhubarb grows best in zones where the ground freezes in winter. Plants require an extended chilling period with temperatures below 40 degrees to produce a crop of stems. Guess you're too far south for the goodness of rhubarb, but as you say, any good fruit makes good crisp!